Life here is mainly trees, frogs and other Yeung family tai chi chuan practitioners attacking you in a helpful manner. Lots of laughing. Thank you, Jim, for some memorable classes and to Warren for all your help. I won’t forget the first time I met Yeung Ma Lee (Mary) Sifu in the Fall of 2008. Mary is Yeung Sau Chung’s second daughter, he had three, all inculcated in the family’s art from a very young age – many thousands of hours of severe training under his watchful eye. 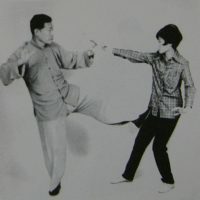 Contrary to martial tradition in China, Mary received the full system from her father – conventionally, full transmission of a kung fu family’s art was only passed down through the sons.